The Galaxy Tab 10.1 gallery is a pretty standard Android affair in terms of functionality, but it has too been tweaked to feel more comfortable on the large screen. Naturally, your Picasa web albums are automatically synced with your tablet. The upper right corner holds shortcuts to the camera, image details or extra settings (like make available offline for Picasa albums). When you are browsing a specific album/date/location/tag the shortcuts change a bit – the extra settings shortcut is replaced by a button that starts a slide show. The icon in the very top left corner becomes active and clicking it brings you back to the full gallery view. Luckily, the Galaxy Tab 10.1 gallery shows the images in full resolution so you can see the finest available detail in your images. If you want to zoom precisely to 100% just use the double tap gesture. If you feel like it you can zoom in even further - up to 200%, though we can't quite see why you would need to. There is one more fancy way to zoom in and out, but we are not sure if it is quite handy. Just put your thumbs (any two fingers will do - it's just that it only feels natural with thumbs) on a picture and tilt the tablet up or down and the photo will start zooming in and out. The accelerometer-based trick is available here too - in the default view, albums with more than one photo inside have a cool 3D shadow effect when you tilt the slate. Samsung have blessed the Galaxy Tab 10.1 music player with a custom interface, which we find more functional than the stock Android one, even if it lacks the impressive cover-flow-like browsing. You can now sort your tracks by album, artist, song, genre, folders, composer or year. Playlists are here too and there are automatically generated most played and recently added lists. Naturally, there’s also a search option, which will be greatly appreciated by those with large music collections. It gets activated by pressing the magnifying glass icon in the upper right corner. Tapping on the song name brings you to a dedicated now playing screen where you have a repeat (one or all) and shuffle options as well as a setting to add the currently playing track to favorites. Equalizers are available too, along with various sound effects like concert hall, music clarity etc. Finally, if there is a track playing in background a dedicated row appears in the notification area showing its name. Strangely enough though there are no quick pause or skip controls right there so you need to open the music player every time. Stock Android Honeycomb doesn’t have a dedicated video player app so Samsung decided to write one of their own for the Galaxy Tab 10.1. Allowing for thumbnail, list and folder view modes, it’s a pretty functional application. There’s also searching so even if you fill that ample storage with short clips you should be able to find the one you need. The Galaxy Tab 10.1 supports DivX/XviD files out of the box. Performance with higher-res videos is great – it played almost all 720p videos like a champ. We threw DivX and XviD files we had at it - all up to 1080p resolution. 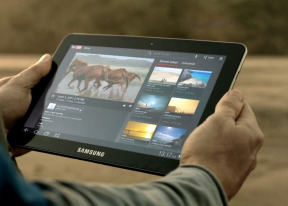 The Galaxy tab 10.1 handled them smoothly and hassle-free. That's really impressive achievement. Now there are a few restrictions though - the MKV files are a no-go and there is no subtitle support. Plus we experienced some issues with the MP4 files with very high bitrate (mostly resolutions above 720p).